Most of the population in Nam Cang are Red Dao and therefore you can meet people of this group right outside your door. There remains some uncertainty as to when the Red Dao came to Vietnam, however it has been surmised that they arrived during the 18th century, not long before the H’mong people. The spoken language of the Red Dao minority group belongs to the H’mong – Dao language family, while the written language is based on Chinese characters, adapted to accommodate the group’s spelling patterns. 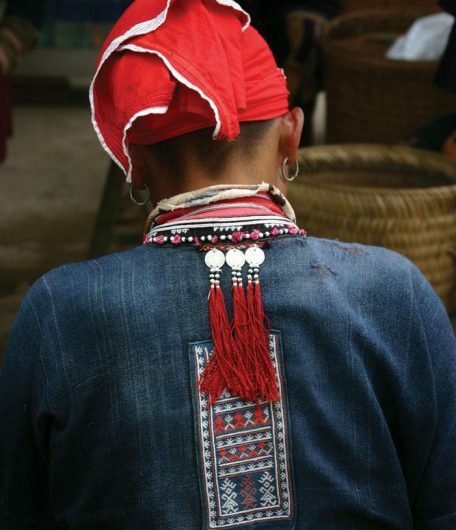 The clothes worn by Red Dao women feature colourful embroidery on both sides of the fabric. Women are usually seen wearing a long blouse over trousers, while a typical outfit for men consists of a short shirt worn with long trousers and a headscarf. Both genders wear a square of fabric attached to the back of their shirts, symbolising that they are children of God. The hairstyles for men and women are similar, worn long on top and shaved underneath, with many women also shaving their eyebrows. A distinctive red turban is worn by Red Dao women, triangular shaped and decorated with silver coins and red tassels. In Red Dao communities, men play a dominant role. In family and community life, ceremonious occasions such as marriages and funerals, the construction of houses, and business in general, it is men who normally take the lead. Dao people have many different family names, with people of different generations distinguished by their middle names and each lineage having its own system. For Red Dao, birth usually occurs in the mother’s bedroom, where aunts and grandmas will help the newborn enter the world before bathing them in hot water. Special rituals are carried out to protect the baby from evil spirits, who the Red Dao fear may harm them or make them wicked of character. These include hanging green tree branches or banana flowers over the front door. A ritual to honour the mother is held when the baby is three days old. Arranged marriages are common practice in Red Dao communities, with a bride selected for a young man by his parents. At the age of fourteen or fifteen, the boy is taken by his father to meet a girl deemed to be fit, healthy and a suitable homekeeper. The couples’ suitability for union is then judged by a diviner who uses a ritual involving a chicken leg and the young couple’s own horoscopes. The boy’s family present offerings such as silver coins, chickens, pigs and jars of rice wine to the girl’s family, the value of which indicate the girl’s own worth. During the marriage ceremony, the bride is carried by the groom on his back. A piece of string is stretched in front of the wedding procession. The bride must step over a pair of scissors which have been blessed to cross the threshold into her groom’s family house. For families without a son, a groom can be bought from a poor family who can’t afford a dowry for a wife for their son. This groom will be forced to live with his bride’s family, causing him great shame. Following a death in the family, a man known as thay tao is invited to the family home by the deceased’s children to conduct rituals and select a suitable burial site. The deceased is wrapped in a mat and placed in a coffin inside the family house, before being carried to a grave built of stones. In former times, the bodies of deceased persons over the age of 12 were cremated. Specific funeral rituals ensure the deceased rests in peace. A three day long ceremony is held in conjunction with initiation rites for Red Dao boys. On the first day, the spirit of the deceased is liberated, on the second day, they are worshipped in the family home, and on the third day initiation rites for the young boys take place. During these rites, a boy will sit on a throne at the highest place in the village until he falls into hammocks hanging below, representing him falling from the sky to be born on Earth, symbolic of the Dao belief that their people are direct descendants of God. Of great importance to the Dao people is the ritual to determine the site for a new house. A household will dig a hole the size of a bowl at night, which is then filled with grains of rice to represent people, cows, buffaloes, money and property. The family will experience dreams the following night that tell them where to build the house. In the morning, the family inspects the hole to see if the rice remains – if not, the house will be built elsewhere. The Dao religion includes elements of Confucianism, Buddhism and Taoism. Ancestor worship is practiced, along with the worship of the legendary holy man Ban Vuong, considered the earliest ancestor of the Dao people.